﻿ Alaska Hunting Adventures - Hunting and outfitting for Dall Sheep in the Tok Management Area of Alaska for nearly four decades. Hunt with guides / outfitters Matt Snyder, his folks Sue and Frank Entsminger and crew. We have lived next to the Tok Management Area (TMA) in the Eastern Alaska Range since 1977. 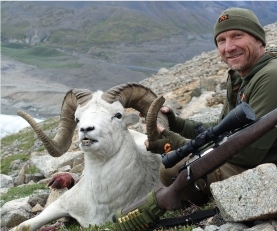 For more than forty years we have hunted the area and have specialized in guided Dall sheep hunts since 1994. Matt is the only guide licensed by the State of Alaska to hunt all 3 guide use areas within the TMA (State of Alaska map). 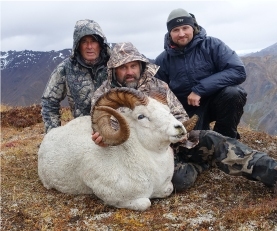 This family's passion for Dall sheep hunting and their reputation for involvement in preservation efforts are legendary among professional hunters throughout Alaska and the rest of the U.S. Click here to go to the State of Alaska TMA information page. 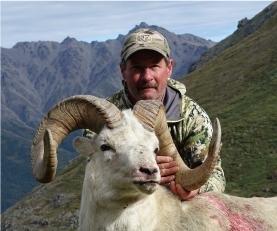 Time to apply for the 2019 Tok Management Area Dall Sheep Permit Hunt!! Click Here to See the Application Page for full Details. "This family is highly successful for their clients. They have a deep passion for wildlife conservation and the future of hunting, and dedicate an endless amount of volunteer time attending meetings and being involved in Alaska’s public process to establish regulations that affect hunting and wildlife conservation. The entire family has earned a great reputation for providing highly professional, successful, safe, fair chase hunts in some of the finest wilderness Alaska has to offer." 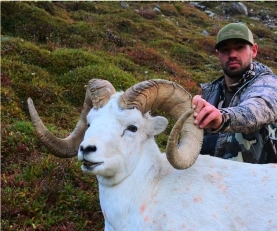 Matt’s specialty is guide outfitting for trophy Dall sheep rams in the Tok Management Area. This family has trekked and hunted throughout the entire Tok Management Area over a period of four decades. Matt, Sue and Frank have taken many outstanding rams over 40 inches for their clients in the Tok Management Area. They are congenial hunting companions and have a strong personal commitment to the safety, comfort and success of their hunters. Alaska Hunting Adventures holds a 39" plus average in the TOK. In the open area the average is 37 plus inches. The Alaska Department of Fish and Game Tok Management Area (TMA) web site displays photos taken by Frank Entsminger with some 40” rams taken while hunting in the Tok Management Area. Alaska Hunting adventures clients also have experienced high success rates on other top Alaskan trophies including brown, grizzly and black bears, Alaska-Yukon bull moose, and mountain goat. Every hunt is custom designed to meet your specific needs. Matt uses the best means of transportation to get you into the remote parts of his hunting area. Most hunting is done in the high country requiring hiking and carrying a pack including a mobile camp. Matt's hunting areas are truly wild. You'll have a good chance of seeing trophy Dall rams, Alaska-Yukon bull moose and prime black bears and mountain grizzlies all in the same area. All of the sweat and hard work will be worthwhile when you finally connect on the trophy that you've always dreamed about, taken in the true spirit of fair chase. You will come as a client, but you'll leave as a friend.